Roger Williams was born in London, sometime in 1603, to James and Alice Williams. His father was a successful merchant tailor who was involved in the importing and trading of textiles. Roger converted to Christianity at an early age. However, his parents strongly disagreed with his choice. At the time, Puritans were being burned at the stake for their religious beliefs. Roger was soon apprenticed to the famous jurist Sir Edward Coke. Under Coke's guidance he attended the Charterhouse School and then Pembroke College in Cambridge. He graduated from Pembroke in 1627. Roger Williams had a tremendous gift for academics. He learned Latin, French, Dutch, Greek, and Hebrew. Williams would become an ordained Anglican minister. Shortly afterward, he left the church to join the Puritan/Separatists who believed that the Anglican Church(Church of England) was corrupt. In addition,Williams did not like the Anglican Church following many of the Catholic practices. Then in 1630, Roger and his new wife Mary chose to join the other Puritans who had gone to Massachusetts in search of religious freedom. Soon after his arrival, Williams was offered a ministerial teaching job which he turned down. Instead they decided to settle in Plymouth, a town that had been founded by Separatists/Puritans. Almost as soon as he arrived Roger began learning the Native languages of the people that lived nearby. At the same time, he began advocating for Native American causes. Roger was particularly disturbed by the fact that the European settlers had taken the land from the Native Americans without paying for it. Roger believed that an individual should be allowed to worship whatever religion they wanted to worship. Williams also advocated for the total separation of church and state. Shortly afterward he became the first advocate for the freeing of all slaves. Needless to say, it wasn't long before his views got the attention of the leaders of the Massachusetts Bay Colony. At first they tried to get him to change his position and keep quiet. Then finally, they gave up and banished him from the colony in 1635. Homeless, Roger Williams wandered aimlessly throughout southeastern Massachusetts until he was welcome by Chief Massasoit. Then in April of 1636, Chief Massasoit sold Roger land and he started building the city of Providence. He called it Providence because he believed that it was “God's Providence” that had brought him there. Roger believed that he could establish a colony in Providence where people would be able to worship according to their own views. During this time period the area around Providence was inhabited only by Native Americans. 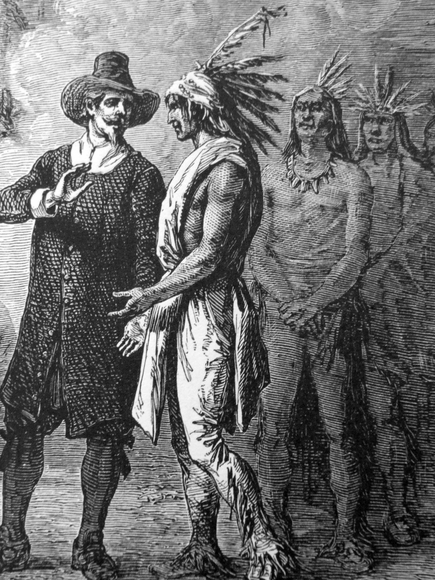 Roger was a master at keeping the peace and he managed to maintain good relations between the colonists of Rhode Island and the Native Americans for 40 years. He was especially close to the Wampanoag and Narragansett tribes, and also learned their languages. Roger Williams became Rhode Island's first governor in 1654. He would remain active in politics until his death. The church that Roger started became the First Baptist Church of Providence. However, after just a short time he decided that he no longer wanted to affiliate with any organization. Roger Williams also became the author of several books including, “The Bloody Tenet Yet More Bloody.” He would spend his entire life fighting for religious liberty. The result was that today we are all allowed to worship the religion of our choosing.